U.S. Cheyenne - Arapahoe scouts from Ft. Reno, Indian Territory present to keep out Sooners. 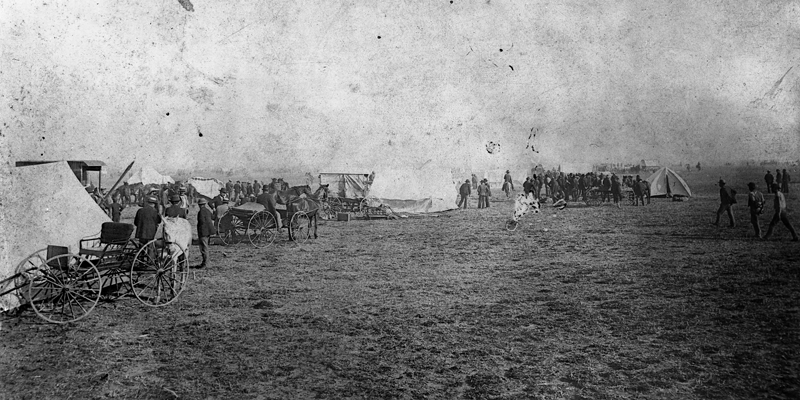 Holding down town lots in Oklahoma City on April 22, 1889. Oklahoma Station before the Land Run, c. 1889. The race for free land began at noon on April 22, 1889, with an estimated 50,000 participants from all over the world. At high noon on a bright and clear Monday, April 22, 1889, a drama roared to life when mounted soldiers fired their guns and blew their bugles to signal the Run of 1889. An estimated 50,000 people began the race from the perimeter boundaries of the Unassigned Lands. Station Master A. W. Dunham, who was standing on a box car at noon at Oklahoma Station, saw settlers almost immediately. "My astonishment was complete - people seemed to spring up as if by magic as far as the eye could reach. 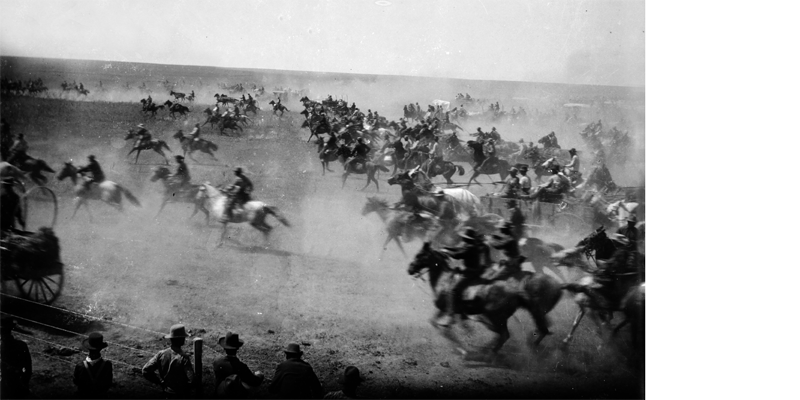 I could see them racing in every direction, some on horses, some in vehicles, and a greater number on foot." The settlers he saw had clearly not started from the perimeter boundaries. Legal settlers began arriving by rail and horseback about 1:15. Those who had started the Run from inside the perimeter boundaries, later dubbed "sooners," had already staked the choicest claims. By the end of the day, nearly every townsite lot and homestead claim was occupied. Some claims were legal and some were not. Without officially sanctioned territorial government, settlers were on their own to make sense out of the chaos.